What does 🍱 - Bento Box Emoji mean? The bento box emoji, 🍱, represents a traditional Japanese boxed lunch, called a bento box, or a meal at a Japanese restaurant in the same style. It's used for such lunches and meals, as well as for Japanese and Asian cuisine more generally, and Western small-plate dishes and snacks. In Japanese, bento (弁当, among other forms) literally just means “lunch box” or “packed lunch,” traced back to a medieval Chinese term for “convenient.” How handy. Bento refers to both the lunch container and the lunch itself, but the container is more commonly referred to as a bento box. Originally made of bamboo, contemporary bento boxes are made of wood, plastic, metal, and other materials. 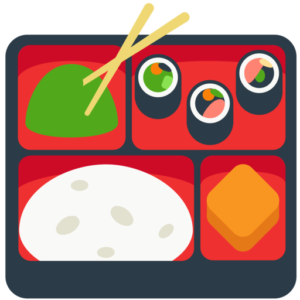 A traditional Japanese lunch consists of rice, plus small dishes of veggies and fish or meat, and bento boxes are often sectioned off in serving them—as the bento box emoji so depicts, like in this screenshot from Emojipedia below. Bentos started out as homemade lunches to take to work or school. Over time, they also began appearing in train stations and convenience stores as grab-and-go food options for commuters and traveling workers. Some Japanese restaurants, especially sushi restaurants in the West, also offer set bento box meals in lacquered, sectioned trays. The bento box emoji was approved in 2010 under Unicode 6.0 and joins a number of other Japan-specific emoji known to confuse Westerners who forget that emoji originate in Japan (such as the Japanese dolls 🎎, sake bottle and cup 🍶, and goblin 👺). As you may have noticed, most versions of the bento box emoji across platforms look more like a restaurant set meal tray than a lunch box. This is likely a consequence of Western designers (and emoji users) being more familiar with the restaurant type of bento box. By far the most popular use of the bento box emoji is to caption or reference pictures of actual bento boxes. 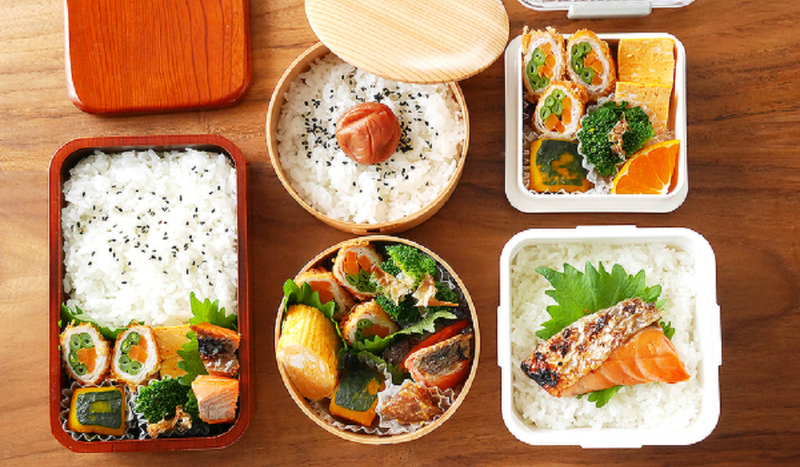 Thanks to some serious social pressure on Japanese parents to send their children to school with lunches that were both nutritionally balanced and aesthetically nice, bento boxes have a worldwide reputation as some of the cutest, most photogenic lunches around. Search interest in the term bento box spikes each year around August or September, which in many Western countries is at the start of the new school year (school starts in March or April in Japan). Part of this could be parents, including many of Japanese heritage, looking at recipes and ideas for lunches to pack for school and work. If you ever need some lunch inspo (and don’t mind a little lunch envy) give #🍱 or #弁当 a look. You’ll also see the bento box emoji alongside photos of non-bento or nontraditional bento box lunches. The bento box also gets used with pictures and mentions of sushi and other Japanese (or, less discriminately, other Asian) foods, regardless of whether it’s a bento-style set meal. Same goes for things like snack sets, small plates, or an array of dishes that may evoke the bento box or its emoji form.